DC's latest New 52 book is about a relationship between two popular, well-established superheroes. Just about every film version of Superman, from Donner's original to Man of Steel, addressed the relationship (or non-relationship) of Clark Kent and Lois Lane. In the comics however, Superman never had a shortage of prospective dating partners, including fellow superhero and occasional goddess, Wonder Woman. In fact, DC's New 52 line took the partnership further by depicting a romantic subplot in the pages of Superman and Justice League. But instead of bringing the relationship to a close after a few story arcs, DC will place it front and center for a new ongoing series. Superman/Wonder Woman, written by Charles Soule with art by Tony Daniel, will launch this October, and features epic action sequences alongside at least one sensual cover. 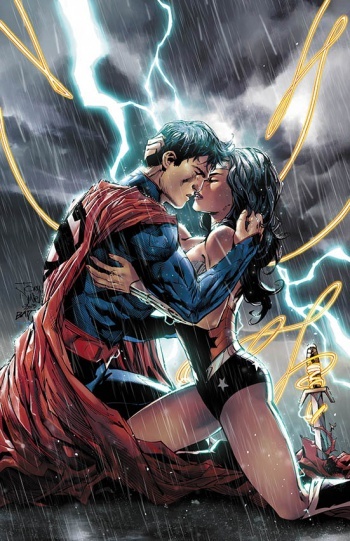 "I think in the entire DCU, maybe you've got a hundred people who actually can fly, and Superman and Wonder Woman happen to be two of them," Soule told Newsarama. "So there are things that only the two of them can talk about. So it's great to be able to write those conversations and have them do the things that only the two of them can do, while also learning all the things that are different about each other." Soule is quick to add that Superman/Wonder Woman won't skip over day-to-day superheroics in the name of romance. "No, it's not the next Before Midnight movie. The book is, at its heart, a huge, epic, action-filled story," Soule confirms. "The stories will be written on a scale that befits these characters." I have to admit, as bizarre as the idea sounds, Superman/Wonder Woman has the potential to become a surprise hit. Romance happens to be the most popular literary genre in all of North America, but it's a field woefully under-represented in superhero stories. (This is probably why Smallville was so popular for so long.) More importantly, this marks a significant shift in how DC historically treated these characters. Whenever previous writers toyed with this relationship, DC would usually wipe the slate clean by saying "it was an alternate timeline" or "they're just friends". Now, the publisher will develop and maintain a canonical, long-term romance between two popular, well-established characters. That's a unprecedented action on DC's part, and while it may ultimately prove too ambitious, I'm morbidly curious to see how it turns out.